The biggest mistake women (and many men too!) make when shopping for a shampoo or a conditioner is looking for pretty labels. Let me tell you, chic packaging is nothing more than eye candy. Reading labels is the ONLY sure-fire way to gather information about the ingredients contained in your hair care products so you can make smart purchasing decisions. This information can also be useful in helping you determine which styling aids to purchase and to understand why certain products are heavy, greasy, or drying to your hair. Companies may (sometimes intentionally) choose to make product packaging confusing. But we as consumers must do our homework. So take a deep breath, get out your magnifying glass, and let’s tackle the ingredient list together. 1. Sodium Lauryl/Laureth Sulfate (SLS) — is a detergent used in most shampoos, shaving creams, and bubble baths for its cleansing and foaming properties. Like most harsh detergents found in your shampoo, SLS strips the hair of its natural oils — often leaving it dry and brittle. SLS may also cause eye irritation, scalp scurf similar to dandruff, skin rashes, and other allergic reactions. Be on the lookout for the words “comes from coconut.” SLS is frequently present in pseudo-natural products under this description. Although there are many websites claiming SLS is a carcinogen, the American Cancer Society has taken the position that SLS and Sodium Laureth Sulfate (SLES) do not cause cancer. 2. Diethanolamine (DEA), Triethanolamine (TEA) — These ingredients are used to stabalize the pH of most personal care products. Depending on the individual, DEA and TEA may cause allergic reactions and eye irritation, as well as dry hair and skin. Neither DEA nor TEA is carcinogenic. However, if either of these compounds interact with nitrites – often present as contaminants in personal care products, a chemical reaction may result, which can lead to the creation of cancer-causing nitrosamines. In recent years, many companies that sell “natural products” have been caught using DEA and TEA in their cosmetic preparations. 3. Parabens (Methyl, Propyl, Butyl and Ethyl) — Parabens are the most commonly used preservative in shampoos, conditioners, and other styling products. The antimicrobial properties of these chemicals help to extend the shelf life of most cosmetics and personal care products by two to three years. Parabens have long been considered safe — but a few recent studies have suggested that these chemicals may actually lead to breast cancer. The validity of these studies have been challenged due to the lack of experimental evidence, but such alarming claims continue to be the subject of further investigation. 4. Diazolidinyl Urea, Imidazolidinyl Urea — After parabens, ureas are the most commonly used preservative in cosmetics and personal care products. Under certain circumstances, exposure to ureas may cause contact dermatitis. 5. Lanolin, Petroleum and Mineral Oil — These cheap ingredients are widely used in greases and pomades formulated for black hair and offer no real moisturizing benefits. In fact, these ingredients often weigh the hair down and prevent the natural oils produced by the scalp from being absorbed by the hair shaft. For a natural alternative, try jojoba, coconut, or sweet almond oils for their conditioning properties. 6. Propylene Glycol — This humectant is commonly found in shampoos, lotions, after-shave, deodorants, mouthwashes, and toothpastes to give a product “glide” or “slip.” This chemical is also an active ingredient in anti-freeze, airplane de-icer and brake and hydraulic fluid. Recent findings indicate that propylene glycol may cause allergic reactions, dermatitis, dry skin, hives, and eczema. Because it is easily absorbed by the skin, the Environmental Protection Agency has issued a mandate requiring workers to wear protective gloves, clothing, and goggles when handling this toxic substance. [i] Material Safety Data Sheets also warn against skin contact with this agent because it has been shown to cause brain, liver, and kidney abnormalities. Beware of PEG (polyethylene glycol) or PPG (polypropylene glycol)—they are related synthetics. 7. Synthetic Colors — Artificial colors are used widely in hair care products for aesthetic purposes. These ingredients frequently appear as FD&C or D&C followed by a color and a number (e.g. FD&C Red No. 6 / D&C Green No. 6). Color pigments may cause skin sensitivity and irritation. The safety of these ingredients is also questionable — because they are derived primarily from coal tar, a known carcinogen. 8. Synthetic Fragrances — Synthetic fragrances are present in most shampoos, conditioners, and styling pomades. The word “fragrance” can indicate the presence of up to 4,000 separate ingredients, many of which are synthetic. [ii] In some individuals, these compounds can induce headaches, dizziness, rash, skin discoloration, violent coughing, vomiting, and skin irritation. For a safe alternative, try purchasing unscented products from your local Whole Foods Supermarket and adding your own fragrance using all-natural essential oils. 9. Formaldehyde — This cheap preservative is used in hair care products containing water to prevent the growth of bacteria. Formaldehyde is a suspected carcinogen and may cause skin reactions, trigger heart palpitations, or lead to joint pain, allergies, headaches, chest pains, ear infections, and dizziness. Despite its possible harmful side effects, cosmetic manufacturers are free to use formaldehyde in your shampoos, conditioners and lotions without listing it as an ingredient. 10. Coal Tar — Many shampoos designed to treat dandruff contain coal tar — although it’s frequently absent from the product’s list of ingredients. Protect yourself and be on the look out for this compound, which is disguised in many forms (e.g. “Stantar”, “Clinitar”, “Medi-Tar” and “Polytar”). While the FDA acknowledges that coal tar is a carcinogen under certain conditions, it has taken the position that it still safe for use as an active ingredient in most over-the-counter dandruff shampoos. Not surprisingly, most shampoo manufacturers are in agreement and continue to use it. Still, in addition to being a cancer hazard, coal tar has been found to cause allergic reactions, asthma attacks, headaches, nausea, fatigue, nervousness, and lack of concentration. Manufacturers often make the argument that these and other synthetic ingredients pose no real, serious threat to our health and safety since they are present in personal care products in such small amounts. Even if this were true, it is hard to believe that these chemicals will not have some long-term effect on our bodies after we’ve been exposed to them day after day, year after year. If you frequently suffer from any of the symptoms described above, you may want to check the list of ingredients on your hair and skin care products. If you have children or sensitive skin, you should also be mindful that chemical additives and synthetic ingredients can sometimes cause allergic reactions even in small doses. Your best bet for protecting yourself and your family is to avoid products containing high concentrations of synthetic ingredients and to look for natural alternatives whenever possible. I know this may seem like a lot to know, but a simple rule of thumb is that if you can’t pronounce/don’t understand the first five to seven ingredients don’t buy it. You can also check out the Homemade Recipes section in my book or on our blog for easy inexpensive recipes you can find around your kitchen. So ladies, be honest, are you checking out the labels when you’re buying products? In addition to the information provided here, you can learn more about the various ingredients in your cosmetics and the different meanings behind the word “organic” by picking up a copy of my new book Thank God I’m Natural: The Ultimate Guide to Caring for and Maintaining Natural Hair now available at Barnes & Noble, Amazon.com, and in the Thank God I’m Natural Store. [i] Propylene Glycol.” Living Toxin Free – Your Resource for Healthy Living, http://livingtoxinfree.org/Articles/PropyleneGlycol.htm. Last viewed on September 17, 2007. [ii] Dadd, Debra. Home Safe Home. New York: Putnams (1997). With such a long list of ingredients to avoid, do you have any suggestions of shompoos that are free of these ingredients? When I went shopping today, it seemed as though everything I picked up had a couple of these ingredients, as well as the products I already use. Thanks! I try to check. I REALLY DO. But sometimes, I honestly can’t afford the products that DON’T have this stuff in them. Once you add in taxes and shipping and handling, it’s a bit much on my budget. i’ve found a friend in Castille Soap but finding a styling agent for my twists and perm rod sets that doesn’t make my hair frizz or sans-response has been a huge issue. With my combo 4a/4c hair, I need some home run hitters. Especially finding a curl activator to keep my curls and such! Yes…we need a list! What are you using on your 4a/4c curls now? I am going to have to look into this list further, do you have any links to some of the hair product info you posted? Most of the products I use are all natural and organic but, I do veer from that path from time to time. I had no idea they put coal tar in hair products!! That’s crazy! My list of things to research keep getting longer and longer! Great post! Here’s a great website to use for your research on products – http://www.cosmeticdatabase.com. I make my own products to avoid these ingredients. It makes it a lot easier and cheaper for me, especially knowing that an orange and water can make a great moisturizer and that a couple of caffeine free herbal tea bags and extra virgin olive oil can me a great sealant and facial moistuizer. Hi ladies, so far the only product I found that is reasonably priced, actually on sale now at cvs for 2/$12. is the Loreal EverSleek (in the gold bottles only, the oter colors contain silicone) they are silicone and sulfate free, 100% vegan. 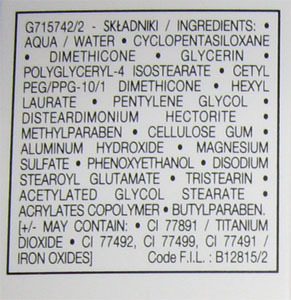 I dont have the shampoo bottle in front of me to confirm every ingredient, but the conditioner has only one ingredient listed above- the Triethanolamine, but it is the very last ingredient so I went with it figuring it cant be enough of it to do any harm. I also have the Frizz- free serum- it contains small amount of fragrance, nothing else, and I have the leave-in creme and doesnt have any of the ingredients listed above, and I have gotten compliments from my braid stylist and co-workers on how great my hair smells, hope this helps! There are lots of natural products on the market like JASONS, Avalon, Origins, Kiss My Face, One Love Organics, Alba, Treat, and Goats Milk shampoo is really good for dandruff prone hair. You can google these brands. Many are sold in local stores and a couple online. My “Natural Hair Bible” has arrived!